More and more military and special forces are packing large defensive focused knives and swords and in fact the original CRKT Hissatsu has seen wide military use. 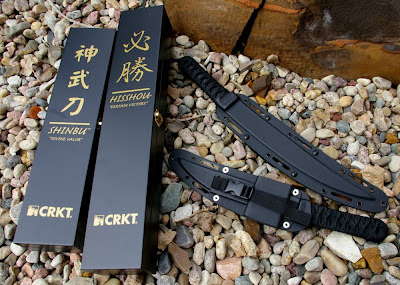 James Williams, the original designer of the Hissatsu, has now expanded his CRKT produced designs to satisfy specific military and special forces requests for larger version of his Hissatsu to include the new larger Hisshou and Shinbu tactical short swords. Especially in the smaller overseas doorways and hallways there is not enough room to utilize standard length katanas or typical broad swords in a tactical environment. Swords are also highly effective against martial arts moves. This are several reasons long knives or short swords have become so popular as they are extremely effective in the short tight confines of the modern urban warfare environment when an operators firearm cannot be used or would be tactically inadvisable such as entry and search operations. Although the standard 5.56 NATO round can be extremely effective, long knives and short swords can be much more effective at dispatching enemies quickly and most importantly completely silent to prevent giving away a position. They have also shown to be more effective at neutralizing hostiles under the influence of pain reducing drugs. As I have mentioned before in other articles, swords also answer the next line of defense when you are out of ammo. There are blade edges designed for spliitng wood, chopping through vines, chopping vegetables, outdoor multi-purpose knives, and of course delivering the most defensive damage possible to an opponent. The CRKT Shinbu and Hisshou are purposely designed short swords blades and edge geometry to be powerful enough to cut through the forearm bones and skin and cut fast and deep on an opponents torso for immediate neutralization. Magazine articles may sugar coat the capabilities of the Shinbu and Hisshou however they are without a doubt the most devastating defensive defensive focused long knives I have ever handled or tested. The reason for this is that these are not knives with knife geometry, nor are they scaled down swords with thinner blades, the Shinbu and Hisshou are shortened full weight cutting swords designed by James Williams, the foremost sword expert in the world. James knows and tests which edges cut best and the Shinbu and Hisshou designs are maximized for cutting things in half. Unlike multi-purpose knife edges, James designed the edges to remain in the cutting stroke longer which deliver deeper cuts. Google a Youtube video of James in action demonstrating the Hisshou and you will see stunning sword cutting power in a very small package slicing effortlessly though about 4”-5” of rolled bamboo mat. Other traits of his designs are a rounded pommel which allows full palm pressure from a support hand to be applied for very powerful jabs/stabs. 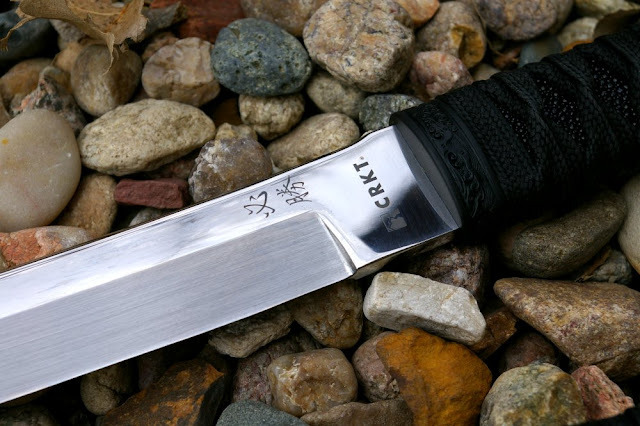 From a classification perspective I would categorize both these CRKT models as swords versus knives as their design intent and purpose is clear. Although both of these swords are substantial and approximately the same overall thickness and design, the Shinbu is the smaller of these two with a 9.25” blade. The Shinbu provides a very powerful cutting stroke with extended reach in a more compact lighter format. 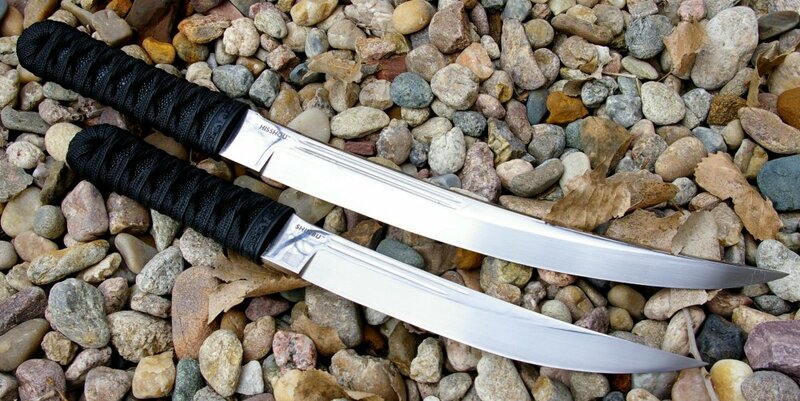 The Hisshou, meaning “Certain Victory”, delivers a very large and powerful 13” marginally thicker blade. 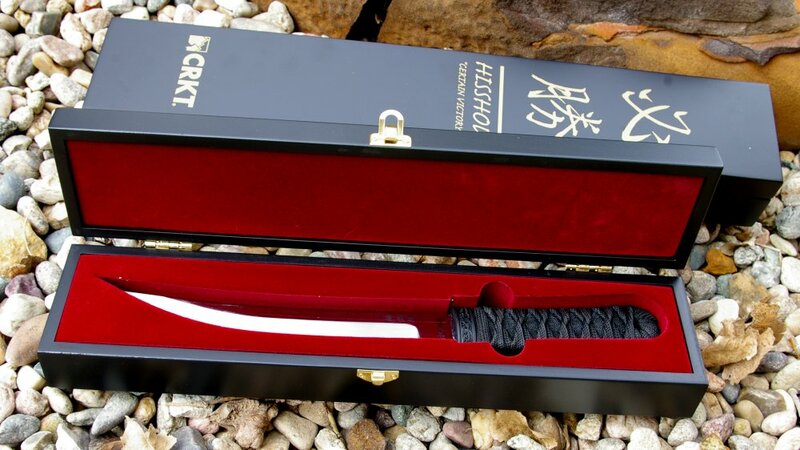 Based on my testing the Hisshou will provide excellent sword like cutting performance as well as incredible slashing and stabbing cuts, however that performance does come in a package about ½ a pound heavier than the Shinbu. Operators will need to make the decision whether their needs will require more cutting power or lighter carry and improved concealment. James has done an outstanding job combining Japanese traditional design with modern world grip and carry practicality. The classic cord wrapped handles are traditional cord over stingray and then are resin sealed to the molded on polymer handles cores for easy cleaning. 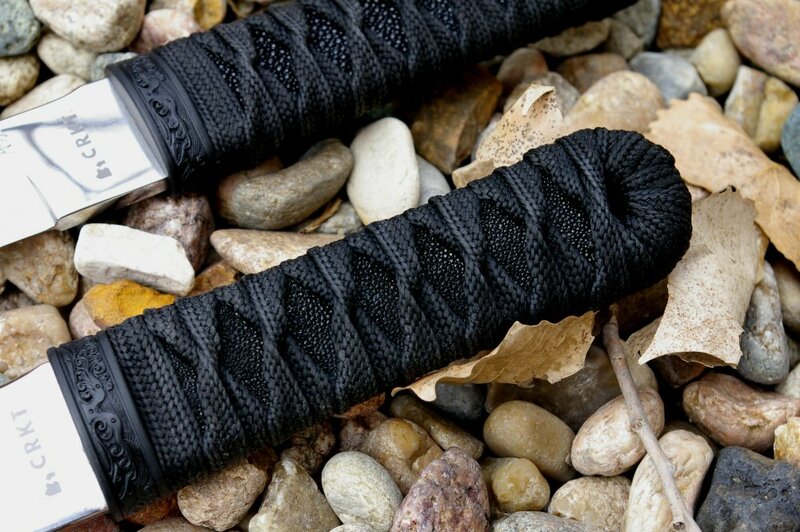 This traditional cord wrapping provides a substantial amount of grip even in wet muddy environments and of course adds to the aesthetics of both swords and provides a permanent handle to blade mount. The substantial feeling blade is a satin finished which does provides some shine, but even the higher luster Hisshou is not overly polished. 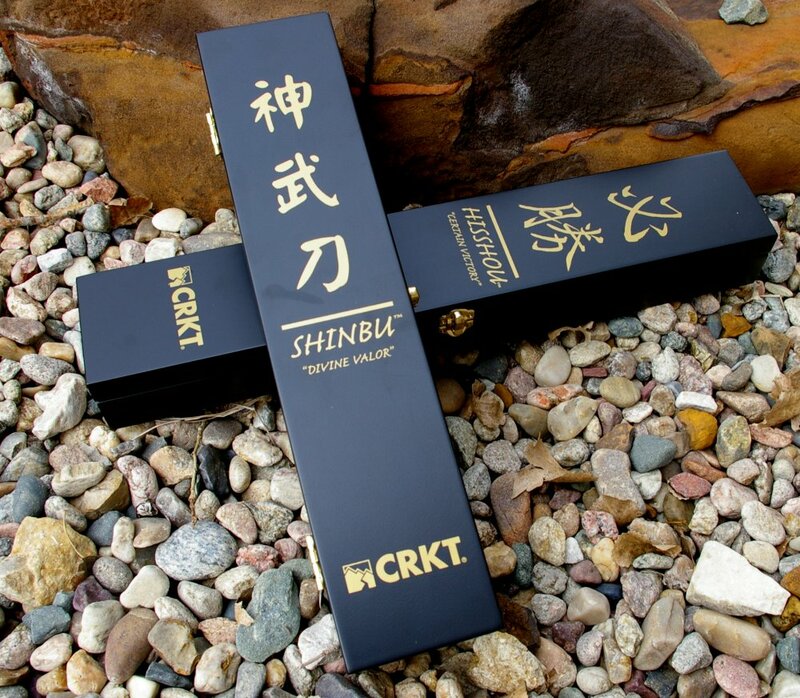 From a packaging perspective the Shinbu and Hisshou are packaged in presentation quality dark lacquered wooden boxes, however you will need to find someplace else to store the well made and thought out Kydex sheaths. Both the Shinbu and Hisshou are both made from a YK-30 high-carbon steel and heat treated to a hardness of 57-59 Rockwell. 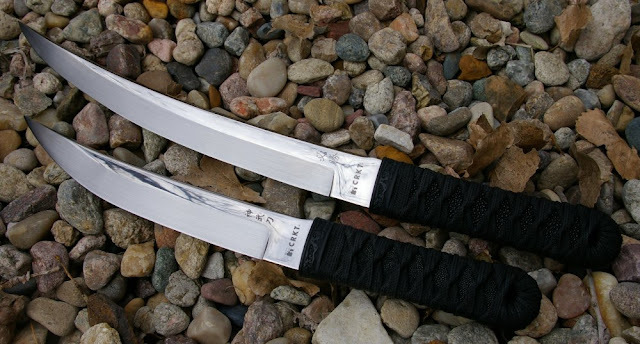 The blades are both flat modified tanto designs with full tang construction and feature the flexible carry custom-fitted Kydex sheaths. The sheathes provides very good retention of each of the knives via guard detents as well as many lashing and mounting points and adjustment flexibility of the belt loop and quick release retaining strap with standard Chicago Screws. Due to the weight of each of these sword I found the detents dis not provide secure inverted/up-side-down carry as the mass of the swords will defeat the detents at some point, however I highly doubt anyone would want to carry them in that manner. The absence of a bunch of retention systems does provide very rapid instant deployment. I was able to easily make snap cuts on ¾” willows right from the sheath. The Shinbu is a direct response to the requests for a larger Hissatsu to provide more slashing ability and enough blade to remove limbs with a 9.25" blade. 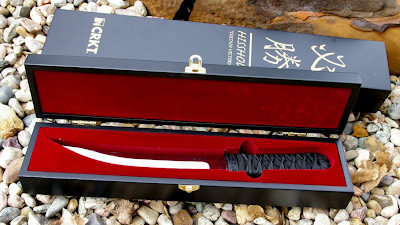 The Hisshou is just an amazing piece of weaponry with that 13” blade and for me seemed to provide all the ability of a Wakizashi without the extra weight. The edge on both of these swords arrived shaving sharp, however I pulled out my ceramic hone and strop and produced a stupid sharp edge which held throughout testing without maintenance. Of note the Hisshou and Shinbu are not as corrosion resistant as the original 440A stainless Hissatsu and will require care and oil as these are not very high carbon and will rust/corrode. Obviously the best testing analog for this and other defensive swords is and probably will be a pig caucus, Mrs Pandemic outvoted the idea in favor of a little woodland hacking and, after a thorough cleaning, slicing some prime rib. Although machetes will always perform the task of machete the best, both the Shunbu and Hisshou performed well in for general clearing tasks easily of up to 1” pines and willows. The blade and edge are designed to maximize deep penetration and wound cavities. The result of this defensive geometry is that when pressed into dual use chopping duties the blade will penetrate so deeply that it will get stuck frequently. There is something that feels a little sick and sinister about slicing meat, however this was the intent of these models. On the prime rib, both were very effective at zipping through slicing duties with precision that would rival many kitchen slicing knives. It made for interesting meal prep and the outdoor sapling cuts satisfied me that both of these swords would easily remove an arm of an attacker. I certainly would not want to be on the receiving end of either the Shinbu or Hisshou. There is no sugar coating that these knives were designed specifically for defensive and offensive use. The Shinbu and Hisshou are not multi-tools or multi-purpose knives, but designed to do one thing very well, go through bone and tissue easily and deeply. It is unfortunate that we have the need for weapons of war and destruction however, the reality is we have the need and generally the team with the better weapons wins. 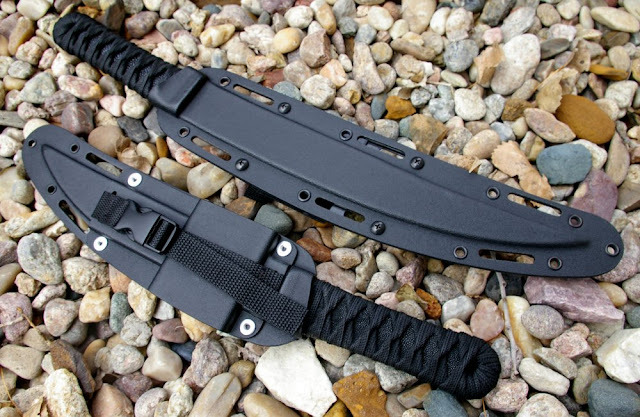 In that case of defensive cutlery, these two short cutting swords are without equal in the industry and fill a unique niche for the operator or preparedness survivalist all in a very effective and extremely high quality package. Exceptional quality and performance for the price. I love these. HOWEVER, there is no way I could afford one. Do you know of anything comparable with a smaller price tag? Unfortunately I do not know of any other options that are compariable for less cash. Getting into quality sword level cutlery is expensive.